Oh, joy. 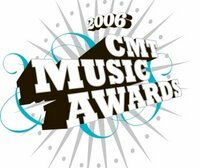 CMT has announced a date and location for the 2007 CMT Music Awards: Monday, April 16, 2007, again at our lovely Curb Event Center. Belmont denizens: Start trying to find parking right...about...now. Oh, well...at least we won't have to deal with a semi-shirtless Jeff Foxworthy doing interpretive dance with "Dancing With The Stars" castoff Lisa Rinna to the tune of "Honkytonk Badonkadonk." Sure, Foxworthy will be back to host, but we think he's learned his lesson about dancing in public.